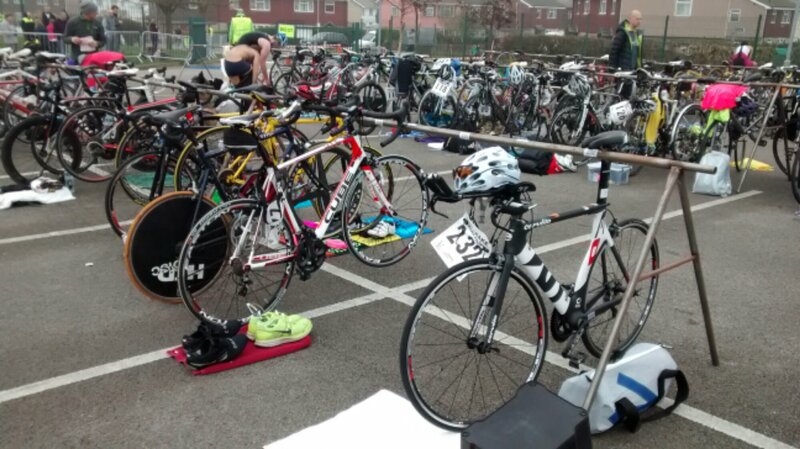 Last Sunday was the East Leake triathlon, a personal favourite as a start of season triathlon, and well set up for beginners in the world of triathlon. Despite having tapered most of the week owing to having done the Wilmslow Half Marathon the Sunday before , I was enthusiastic about getting into the water and onto the course. The highlight for me was the run- I felt light and strong and knocked significant time off previous years’ run times. I didn’t even suffer from heavy legs after the bike as I have incorporated regular brick sessions into my training. The bike segment was marred by almost being bulldozed off the road by a motorist who forgot to check left before turning right onto the main road, plus a minor mechanical malfunction. The swim was not my proudest moment, but as I’ve not been putting in the hours in the pool, I didn’t expect to perform miracles in the water. Compared to last year the weather was positively tropical- 2013 was almost called off due to snow. All in all a good morning out and I was pleased to see that the event still draws plenty of first timers, much like myself not too many years ago. My next event is the Paris marathon this coming weekend, the first of three challenges in France this summer (but more on that later this week). Having three consecutive races in three weekends is hard because of the recovery and tapering in between- I feel like the net effect is a negative one, but with a PB in the Wilmslow and a PB in Leake, I still feel on good form for this coming Sunday!